Much as I love Rio de Janeiro, I was averse to Rio. I didn’t like the trailer. I didn’t like the ugly design of the main birds, or the rather whitewashed, Hollywood vision of Brazil where everyone is a party animal and nobody is geeky or awkward. Well, the birds are ugly and this Brazil can still be called somewhat whitewashed, there are geeky Brazilians here, and much to recommend the film. Yes, probably I would have preferred the Pixar project with the blue-footed newts that was cancelled when they realised their plot was too similar to this one – and didn’t want to be the Dreamworks of Antz, Shark Tale and the rest. 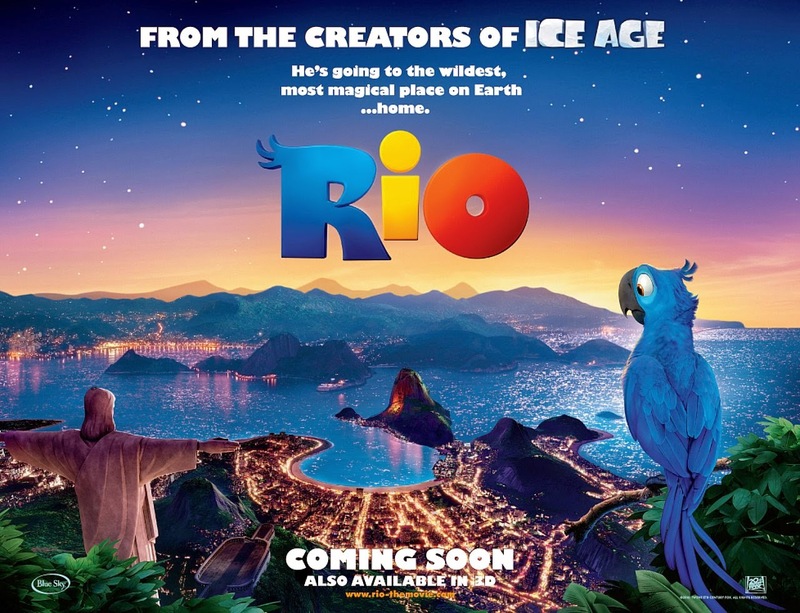 But in its own right, Rio has much to recommend it – not least of which being the awesome soundtrack. This is a classic fish-out-of-water romance, but with birds. Blue is a rare Blue Macaw – the last male of his species. As a chick, he was taken from the Brazilian forest by smugglers and was to be sold as a pet – but fell off the back of a truck and was taken in by a nice geeky girl who runs a bookshop. When a Brazilian scientist comes to whisk the two of them to Brazil to meet the last female of the species, but smugglers once again get in the way, and the birds end up not only chained together, but out in the wild with an evil cockatoo on their feathery tails. Once again, though, just as with Bolt the film doesn’t feel like it really has the capacity to move the audience. Though the stakes are the future of a species, that never feels like it’s in question. There’s no real sense of danger, nor of triumph. And the way Blue having to learn to fly is signposted so heavily all through the film just feels incredibly clumsy. But there are a few scenes that make the whole thing worthwhile – when the birds all burst into song and Jewel has a solo verse, the way Carnaval itself is rendered, and some of the shots of Rio. But it certainly could have been better – and more satisfying. And there’s something deeply amusing about how they tried to render two birds with hooked beaks kissing.